[ADVERT]The Dandenong Ranges is not just home to popular attractions like the Puffing Billy, Skyhigh Lookout, the Tesselaar Tulip Farm and Kallista Market but also the iconic National Rhododendron Garden to rival the likes of the Botanic Gardens and Leura in the Blue Mountains. The Garden attracts thousands of visitors through the four seasons and thanks to a couple of good friends who invited me for a walk in the Dandenongs, I was able to experience this magnificent venue in Olinda. Here are seven reasons to help you make that visit and enjoy the Garden with friends and family. 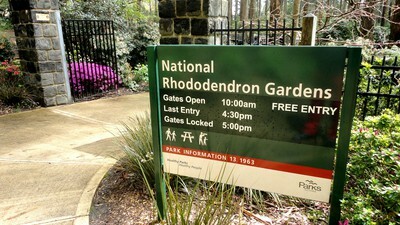 The National Rhododendron Garden is described as the jewel of the Dandenong Ranges. A stroll through the Garden and I can see why it is a horticultural jewel. Framed by mountain ashes, the tallest flowering trees in the world, is 104 acres of brilliantly coloured blooms. It is home to lyrebirds, parrots, rosellas, ducks and other species that congregate near the various ponds that dot the manicured landscape. Thanks to the Australian Rhododendron Society and the Forest Commission, the site of the Garden was selected from the Olinda State Forest on the eastern ridge of Mount Dandenong and the National Rhododendron Garden was born in 1961. It was designed as a combination of individually different gardens and spaces. By 1995, the Garden came under the management of Melbourne Parks and Waterways (now Parks Victoria). With different walking trails and sections available, you can inquire with the staff in the gift shop at the main entrance about the various areas and the best picnic spots in the Garden. Originally designed as a showcase and national collection of rhododendron species, the National Rhododendron Garden as per the name-sake boast 15 000 rhododendrons from approximately 550 species. In addition, the Garden is home to 12 000 azaleas, 3000 camellias, 250 000 daffodils, lupins, golden wattles, laburnums, proteas and cherry trees. As spring approaches, the Garden is transformed into a multicoloured display with the sunshine yellow of daffodils in August, and by November the rhododendrons and azaleas will bloom a loud and gaudy orange, pink and red. It's the perfect setting for art, romantic walks, Mother's Day and wedding photography. Thanks to the National Rhododendron Garden, you don't have to travel all the way to Japan in March to enjoy Sakura, or the Cherry Blossom Festival. With its Cherry Tree Grove, the Garden brings this renowned and revered Japanese Spring festival to Melbourne in September every year. The cherry trees in full bloom is a spectacular sight and the Garden's Hanami Cherry Blossom Festival offers picnic under the small pinkish white flowers and sipping Japanese tea. Make sure you scribe the festival's date and month into your calender if you're planning a Japanese theme wedding. I was surprised to see a wollemi pine in the National Rhododendron Garden, which probably doesn't mean much to most people except botanists. It is actually one of the greatest botanical discoveries of the 1990s. The simple reason is the wollemi pine is a living fossil from the age of the dinosaurs. Prior to its discovery in NSW by David Noble in 1994, a officer of the National Parks, the previous known samples were only from leave, cones and pollen grain fossils. The National Rhododendron Gardena offers many excellent picnic spots surrounded by the rich flora without waiting for its Hanami Cherry Blossom Festival. Pavilions and rest stops dot various areas allowing you to stroll, stop and enjoy the myriad facets of the Garden. You can also picnic by the lake and the lookout point that provides scenic views of the the Yarra Valley, Mount Baw Baw, Warburton Ranges and Silvan Reservoir on a clear day. If you are without your own food, help is available onsite. Open from September to November, Café Vireya offers a picnic basket complete with bubbly and a rug to help you make the best of your picnic day. If you prefer to sit on the terrace, the café also offers Devonshire tea to accompany the flora vista. For visitors who want a quick tour of the Garden, there's the Garden Explorer bus operating from 8 September to mid-November. It offers a 25 minutes non-stop guided tour in comfort at $8 for adults and $5 for students, children and concession card holders. Children under five are free. Families with 2 adults and up to 4 kids get a $25 deal. As seats are limited to 24, it is best to inquire and make prior reservations. Perhaps the best reason to visit the National Rhododendron Garden is the simply fact that its free. There are no entrance fees to the Garden courtesy of Parks Victoria who manages and protects Victoria's many iconic and treasured natural places for all of us to visit. Thank you. Hanami festival was not held in 2014. I presume it could have something to do with the logistical issues of traffic and parking control because in 2013, the Hanami festival caused a chaos in Orinda with cars backed up for miles in either direction. The residents were naturally quite upset. Having said that, the National Rhododendron Garden is indeed a gem! This is a wonderful article, thank you. Have a family member visiting for U.S. next march, and was thinking this would a lovely place to take her, especially as she loves our native birds. Hanami festival has ceased operation due to the constraints of its popularity and the hazards associated. The explorer bus tours will operate from September 9 2015 into mid November. Prices are now Adults $12 with concession at $10. This is an in depth botanical and historical tour in a covered mini bus well worth the fee. Yes - a fantastic place to visit - and reason #8 - if you get lost, you could find yourself outside the park picking fresh chestnuts and wild strawberries !